Here are some graphic examples of different kinds of red paint colors. Number 2 is a toned down red-orange, but here it almost gets a green look. The eye is looking for some contrast. It takes the most neutral shade around, to evoke green. The reds on the left are toned vermillion-reds (more orange reds), those on the right go towards carmine (more magenta red). The left ones will give a more solid and 'earthy' feel, the ones to the right will give a more lustrous, royal or artistic-cosy feel. The difference between vermillion red paint colors and the scarlet reds is bigger then it seems - scarlet red is strong but 'holding back', while vermillion red makes a much more out-blasting appearance. In its prismatic (immaterial) form, it is frightening and hardly bearable. But when you add white or brown to it (toning it), it becomes material and then it's pleasant to have around. For painting a really deep and beautiful scarlet red, scroll down to the end of this page. Orange was put here, to show the difference between 'red' and 'orange'. Carmine is the 'coldest' red, although it's still a warm color. Painting reds light over dark will make them more "earthly" and solid - which can be nice, if you don't like very strong colors. When you add white, you go towards the pinks and skintones. Also when you paint a medium red over a very dark background, it will be sort of moderated. 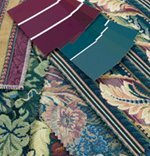 When you dab it on with a dry brush, it might look like a textile (velvet). 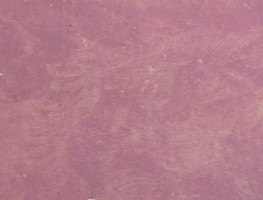 Red paint colors can get a warm and immaterial glow if you paint them on a lighter surface. Even a pink skintone gets a pleasant glow from that. A radiant red (like number 1) gets more radiant when painted over a light background. When the the background is much lighter, your brushstrokes might be visible - it's best to paint with a brush, and give it some nice strokes. When you paint the whole wall in the same repeated gestures, it will look good. Lightwoods are best completed with more neutral or light redtones. Yellows and oranges are better. Yellow ochre is about the same shade as lightwoods. Oak has a bit of a neutral, greenish hue. Maybe better not put it next to very strong reds (it will be pulled towards green). Brown oranges are better. Dark (stained) wood looks very good with strong reds. When your reds are too fierce, you can use an earth color to tone them down. Eventually, paint them over the red. Every prismatic red has a matching earth color. 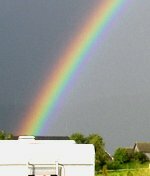 The upper colors of the next picture are prismatic colors, 'rainbow' colors. Underneath, you find the earth colors with the same 'hue'. Another way to moderate the overwhelming power of a onesided red, is to add its contrary color: green. If you don't add too much, your red will stay red, but with a dimmed power. Here's a recipe for a very deep and radiating prismatic red: take a strong medium red (like number 5 of the above picture), and paint it over with a transparent more magenta red (like number 6 of the picture above). Mix the magente 1 on 1 with a transparent laquer or latex glazing medium. The "glow" will be tempered and made bearable to the eye, but the whole will still be a prismatic color. Depth is created, instead of an outward shine. This is how Barnett Newman did his "who's afraid of red, yellow and blue". There are dozens of red paint colors, and the best way to visualize the effect of them in your own interior design, is working over pictures of your own house with Color Style Studio, this is house paint software . I've ordered Color Style Studio myself too - you can have me work over your pictures, or get this program yourself. Need a little help in Choosing paint colors? Browse around on this website, for finding references and knowledge to help you base your decisions on. 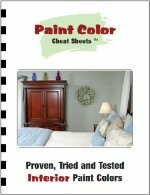 For a more step-by-step guide in choosing paint colors, consider using the Paint Color Cheat Sheets. This guide was developed by a color consultant, who works together with a painting contractor (her husband). 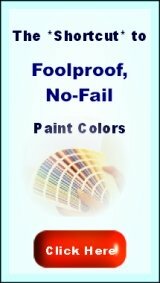 This guide can help you save a lot of time and money - it speeds up the process of making decisions, and helps to prevent costly mistakes (in the form of wrong paint colors).